How often do you spoil your feet? Well, now that I have a pair of Pink Nature's Sleep Closed Toe Terry Slippers with Memory Foam I get to spoil mine everyday! Plush comfort and luxury with every step. Indoors or out, these closed-toe slippers offer the perfect balance of softness and support in thanks to the visco-elastic memory foam inner sole, which cradles and contours to your feet while absorbing pressure and impact. 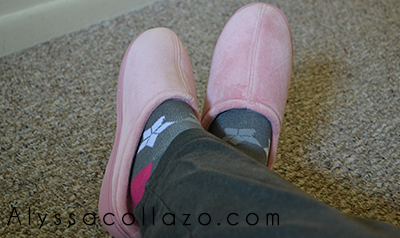 What I like most about the slippers is while they are super-soft and plush, they’re lightweight and easy to walk around in. My Nature's Sleep Slippers are the first thing I grab in the morning! Now instead of the cold hard tile, I have a cushy bed of softness for my feet! I had no idea I could love a pair of slippers so much. I also love the rubber sole bottoms, I don’t have to switch into flip-flops for a dog walk at 6am or a quick walk to the bus stop! My Nature’s Sleep Closed Toe Terry Slippers with Memory Foam retail for $30. They also have an open toed version that goes for $25. Now that might seem steep for a pair of slippers at first glance, but it's totally worth the price. They'd make a great gift for any occasion! Now you can pampered your feet too! Nature’s Sleep is offering one lucky readers a pair of their own Memory Foam slippers – either closed or open toe, in the color and size of their choice. One (1) winner will receive: A pair of their own Memory Foam slippers – either closed or open toe, in the color and size of their choice. Ends 9.10.14. DISCLAIMER: All products received are complimentary for testing purposes from Nature’s Sleep/PR Company. All opinions stated are my own and are not influenced by any affiliates. Those slippers sound so comfy! My feet are ALWAYS cold, so I could really go for a pair of those. Those slippers look super comfy. A good pair of slippers is your best friend, especially in the winter. I like the pink ones on your feet. They look so warm. I for sure would LOVE the slippers! Thanks for sharing the chance to win! I practically live in closed toe slippers. I am wearing a leopard print pair right now! My feet are always cold, even in summer, so I love having them around to just slip my feet into. The Nature's Sleep slippers look so cozy! I would really love to have a pair of those slippers. I love a good pair of slippers! I wear them year-round! Yes!! I love a great pair of slippers and these look super comfy! I would love the close toed slippers! They look so comfortable!!! I'd definitely love new slippers, and those look super comfy! These look so comfortable and I need new slippers! Those look sooo comfy. Perfect for the winter coming up! well those certainly look cozy! get me a pair and a cup of coffee and i'm a happy lady! Slippers saved my feet when I was pregnant! I'm all about cushy slippers, especially in the winter! Well if price was no option I'd LOVE the Glacier Gel Memory Foam Mattress. But if I was buying, lol, I'd like the Open Toe Memory Foam Slippers in Mocha. Sapphire Gel Memory Foam Mattress looks so comfortable! I would love to own a memory foam mattress. Love this giveaway! I have no slippers and cold tile! 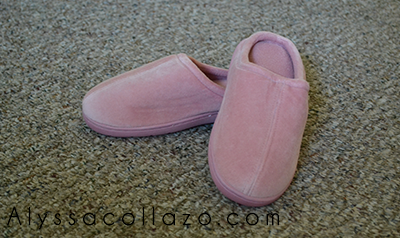 I love the Pink Nature's Sleep Closed Toe Terry Slippers with Memory Foam. Other than these slippers? The 4" memory foam topper would be awesome! I would love some comfy slippers! These look so comfy and warm! I would love to sleep on the Sapphire Gel Memory Foam Mattress. Sounds awesome!